Recently, my wife and I upgraded my phone/television/Internet service. Well, upgrade may not be the most accurate term, because we cut back on a lot of television channels that we never watched (how many channels dedicated to cooking does one really need, anyway?). Since our three services are bundled, we got a “new” digital telephone service, with a whole lot of bells and whistles that we’ll never use anyway: Call Forwarding, Call Blocking by number, you know, stuff like that. Blah, blah, blah… I follow the prompts and hang up the phone. Then the website prompts me for more setup options. OK, at least I don’t have to listen to the voicemail lady tell me to press this number, or that symbol, or to speak the command in Ancash to continue. Websites are generally the superior interface for these sorts of things. Then, one of the options presented to me is something like Simultaneous Ring, which, despite sounding like a wedding-day custom, didn’t really appeal to me. 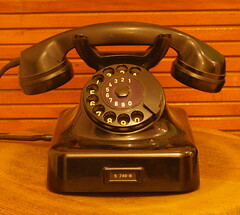 Its purpose is to ring another number at the same time someone calls your home number. So, if someone were to call my home, it would ring at, say, my cell phone at the same time. Without hesitation, I kept that feature disabled. There is no way in God’s green Earth that I would want that. The only people who call my home are pests who want to sell me something, pests who are asking for donations, and, especially here in the United States at this time of year, pests who want me to vote for them. It was at this moment that it occurred to me – my home phone is pretty much useless now. It has devolved into a marketing tool for other people! Despite my registering on the Do Not Call List, I still get these calls. Now, here’s the kicker, and the thing that really gets my goat: I’m paying for this – literally AND figuratively! I use my cell phone for all my calls now. My friends and family with whom I care to speak have my cell number. Any time a phone call comes in to my land line, I let it go to voice mail for immediate screening. Before I go off on a rant, which I’m really close to doing, I’ll close with a question to you, dear readers. If you have a cell phone and a land line, do you use your land line for anything else other than a screening service? Are the only folks, or a large majority of them, who call your land line those who want to sell something? Would you cut the phone line permanently, if you haven’t already? This entry was posted in Thoughts and tagged Call Forwarding, Landline, Mobile phone, Personal, Telephone, True Story, Voicemail, Wife. Mobile reception at home is almost non-existent and even when I do have great reception the sound quality is awful, so I hate talking on it for more than a few minutes. Mike, that’s the one weakness in mobile that remains. I admit that I use the land line when I have to make a call and be certain I won’t be dropped inadvertently. This is the first time in 6 years that I have had a land line. We only did it because of emergencies and the security system. But since I use it but only to talk to a few people. I most definitely screen my calls. If the caller ID shows something that doesn’t even look familiar, I’m not picking it up. We did just cell phones for all that time with no issues, so I’d say it’s simply a preference now. They aren’t really necessary for the most part. There is part of me that wants to do some heavy purging. Part of me wants to just drop cable completely and move to Netflix or something. I’m not ready to give up the land line yet just because the reception on my mobile isn’t quite that good. No one ever calls my land line BUT I occasionally use my land line to call other people. Another year or two and I think the decision will be easier. I think you’re right – it will take a little time, perhaps a year or two as you said, and the technology and reliability will be there.